Perfectly Created Chaos! : Tutorial: 3x5 Notepad holder: "Where Dreams Go"
Tutorial: 3x5 Notepad holder: "Where Dreams Go"
I am here today to share a quick step by step tutorial for a fun notepad holder you can slip inside your purse or perhaps give to a friend or keep on your desk at work. There is a way to do this for a regular 3x3 post it notes; but I really liked this larger size. It is really quite simple and fast to put together. There are more photos for each step at the bottom of the post. 3. Cut two small slits in the middle from the fold to the center about 1 inch apart (this is for the pen) It is important at this point that you make cuts with the 3 1/8 side facing up because this will be the front. 4.open up the paper and place sticky strip or some other type of strong adhesive along the bottom edges of the middle creases to seal. 5. Decorate your front as desired. 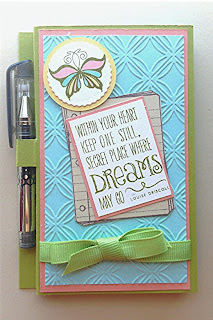 For mine, I used Simply Chartreuse, Aqua Mist, and Melon Berry Paper from Papertrey Ink. 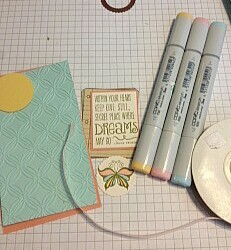 The stamp set is "Blue Skies" from Verve Stamps. I used the "Geometric Rings" embossing folder by Provo craft. 6. 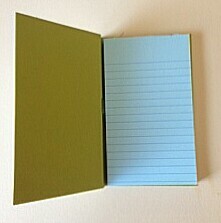 Attach your notepad on the inside with sticky strip or other strong adhesive. Pinterest Inspiration Wednesday: Hi There!